I've written so much about Hollywood's obsession with remakes that I've run out of things to say. OK, that's not true -- it's very rare that I write that a remake is any way justified. We see so many movies which were perfectly fine to begin with and someone decides that they need to tinker with it. The 1951 version of The Day the Earth Stood Still is a science-fiction classic which helped to define an era of movies. However, it is a very dated film whose look and message are very specific to its time. Therefore, an updated version sounds like a good idea. But, good ideas don't always pan out. The Day the Earth Stood Still opens with scientists discovering an object hurtling towards Earth. Biologist Dr. Helen Benson (Jennifer Connelly) is part of a team of specialists who are called in to help deal with the impending impact. But, instead of crashing into New York City, a huge glowing sphere lands in Central Park. The military surrounds the object and a being emerges from it. A nervous soldier shoots the being, who slumps to the ground. Following this, a gigantic robot comes out of the sphere to defend the being. The being is rushed to a special military hospital unit, where a surgeon discovers that there's a humanoid inside out of a special suit. The being is called Klaatu (Keanu Reeves) and he calmly asks to be released from military custody. The military, represented by the Secretary of Defense (Kathy Bates), of course, refuses. Feeling pity for him, Dr. Benson helps Klaatu escape, and Helen learns that the alien has come to Earth to warn us that our time on this planet is about to come to an end. Can Helen convince Klaatu that humanity deserves to continue? Again, while the original version of The Day the Earth Stood Still is undeniably a classic, a remake isn't out of the question. The black & white film carries a message about nuclear war which smacks of the "Red Scare" era and has little relevancy today. The special effects are definitely dated and the movie's talky nature makes it somewhat slow. However, there are classic moments in the movie. Who can forget Klaatu emerging from his spaceship for the first time or when Gort, the robot, attacks Patricia Neal? And what about "Klaatu, barada, nikto"? Even Ash sort of got that one right. But, this new version of The Day the Earth Stood Still misses the boat completely. The movie contains a few of the same elements of the original movie, such as Klaatu emerging from his ship and being shot, and Gort advancing on the soldiers. However, outside of those things, and the idea that Klaatu has come to Earth to let us know that we are doomed, the movie goes off in its own direction. Well, it thinks that it's gone off in its own direction, but it really hasn't. The movie is simply a mix of Independence Day and Starman. An alien comes to Earth, and uses human DNA to assume the appearance of one of us. He's here on a mission and interference from the U.S. military throws him off course. Now a fugitive, he must rely on the assistance of an Earthling in order to fulfill his purpose. In the meantime, other spaceships are spotted around the globe, and soon, famous landmarks are being leveled. (Although, the movie must have played well in Dallas, Philadelphia, D.C., Miami, Buffalo, and Boston, as we get to see the Meadowlands being leveled.) Did they actually think that we hadn't seen these other movies and we wouldn't think of them while watching The Day the Earth Stood Still? So, why didn't the filmmakers simply update the original? Who knows. They certainly couldn't have thought that too many people would be familiar with the 1951 version and that they simply had to do something "new". The result is a movie which is derivative of other sci-fi films, instead of plucking ideas from the original. I mean, they waste Gort. Where's Gort attacking people? Where's "Klaatu, barada, nikto"? Instead, we get nanobots. Who wants nanobots? The saddest part may be that this is actually a good vehicle for Keanu Reeves, as he comes off well as the emotionless alien. Truth be told, the whole affair feels like a movie which started life as a different script and somewhere along the way it was molded into a remake of The Day the Earth Stood Still. If only it could have been molded into a good movie. 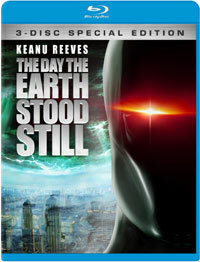 The Day the Earth Stood Still features an annoying offspring of Will Smith on Blu-ray Disc courtesy of 20th Century Fox Home Entertainment. The film has been letterboxed at 2.35:1 and the Disc contains an AVC 1080p HD transfer which runs at an average of 25 Mbps. The image is very sharp and clear, showing no grain and no defects from the source material. The colors look fantastic, most notably the swirls in the spheres and the image is never overly dark or bright. The picture shows off a nice amount of depth and the blemished skintones let us know that the detail level is quite good. The Disc contains a DTS-HD Master Audio 5.1 track which runs at 48 kHz and an average of 4.2 Mbps. This track provides clear dialogue and sound effects. The stereo effects are very good, as they are highly detailed and show nice movement from side-to-side. The surround sound effects are nearly constant and they really come to life during the action scenes. The explosions and the arrival of the sphere provide us with room-shaking subwoofer effects. This is yet another great DTS-HD track from Fox. The Day the Earth Stood Still Blu-ray Disc contains several extra features. We begin with an AUDIO COMMENTARY by writer David Scarpa. "Klaatu's Unseen Artifacts: The Day the Earth Stood Still Picture-in-Picture Track" offers a look at animatics, concept art, and a closer look at how the special effects were done. The problem here is that information being given doesn't always match the scene which we are watching. "Build Your Own Gort" allows you to pick parts from various design concepts. The Disc contains three DELETED SCENES which run about 2 minutes and don't provide a great deal of new information, if any. "Re-imagining the Day" (30 minutes) is a making-of featurette which examines the movie by exploring the 1951 original film, and comparing the two. "Unleashing Gort" (14 minutes) contains interviews with the filmmakers who discuss the challenge of creating a new Gort. This contains a great deal of concept art. "Watching the Skies: In Search of Extraterrestrial Life" (23 minutes) is a mini-documentary which looks at the possibility of life outside of Earth through comments from astronomers. "The Day the Earth was 'Green'" (14 minutes) looks at the environmental message of the movie and how the production itself was "green". The extras are rounded out by three STILL GALLERIES (Concept Art, Storyboards, and Production Photos) and the THEATRICAL TRAILER for the film. The Blu-ray Disc set also includes a second Blu-ray which contains the 1951 version of The Day the Earth Stood Still...which was a huge mistake.